A bathroom is one of the most used rooms in our homes, therefore, it is bound to get stained up. Everyone wants their bathroom to remain as good as the day it was all new and fresh. It is daunting to maintain a sparkling look on your bathroom floor tiles but this does not mean that your bathroom floor tiles are justified to always look messy. It is good to maintain a high level of hygiene. 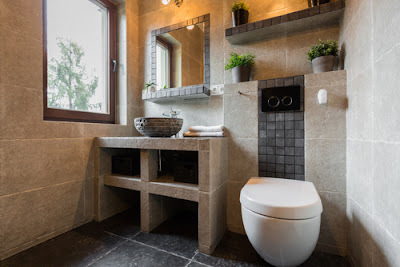 With time, your bathroom tiles are bound to have an accumulation of dirt and before you know it you can’t even stand the look of grime covering your bathroom. Without the proper cleaning methodology you will end up breaking your bones scrubbing without much success. It is therefore wise to ensure that you do the needed research and invest in a good cleaning company once in a while to do the cleaning for you. To ensure your bathroom is clean you need to use the appropriate cleaning solutions. With these you will require little effort to scrub and wipe off the stains. You also need to make sure that you don’t entertain dirt build up in your bathroom flooring this can be done by regular cleaning. It is important to understand what grout is before moving on, it is simply the sand that is used to bind the tiles, sink, bathtub. It is very guilty in accumulating dirt not necessarily the one you can see but even the one your naked eyes does not see. This dirt comes from the soap that we use when showering. 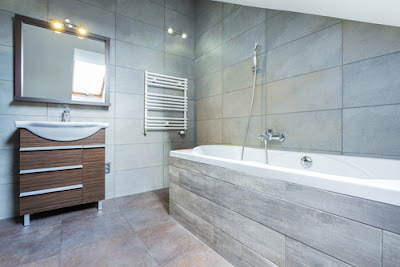 If these places are not looked at carefully they then form a dark cover in your bathroom floor tiles and if proper measures are not taken your tiles end up stained up and all messy. There are different colors of grout which are used to bind tiles and the choice is yours. There are different problems ganging up to make your tiles unpleasant. These are soap residue, yellowing, spots, and mold. You should check out these causes and work on them and if you take the required measures you won’t have to struggle much in maintaining cleanliness. 1. Avoid scrubbing hard- It is advisable to practice cleaning your tiles in a circular motion. This helps to avoid creating damage on the grout and the tiles. By using a hard brush or a wire brush you are only making matters complicated and wasting much energy in the process. You should use a brush that has soft bristles. 2. Be patient- You will be amazed to find out that most of the stains do not require scrubbing or expensive cleaning solutions. They only require wiping off with a clean rag and that’s it.Only use a brush if the stain is stubborn and doesn’t clear even after using the rag. 3. Right products- There are those products that are not safe from your bathroom floor tiles. They only destroy rather than cleaning them up. It is wise to look at the label on your solutions before purchasing. Look whether it is wise to use them bon the grout and the tiles. 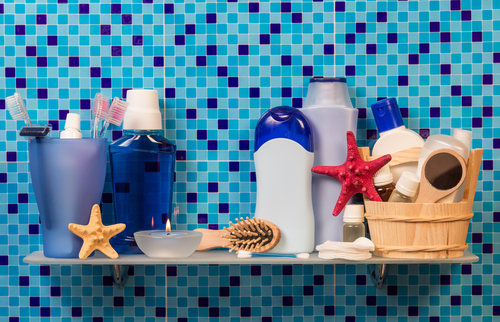 Remember that whatever you use on your grout directly affects your tiles. This is because they are connected. You should therefore use the right products for the right results. 4. Examine your products- By doing this you will be preventing damage on the tiles and at least you will be sure of what you are putting yourself into. There are some risks in using a product without testing it, these are yellowing or fading. To test your products check for that hidden place and do the test.If you see any change that you wouldn’t want to see on your whole bathroom then discard the solution. 5. Vinegar- You have probably been using this product in your household but you have never really thought of using it as a cleaning product. This is a natural product which works magic on your bathroom floor; it cleans out the stains and leaves it sparkling fresh. All you have to do is make a cleaning solution with it.Mix two cups of warm water with the same amount of vinegar and add a teaspoon full of dish detergent. Put this in a spray bottle. This solution leaves no stains in any part of your bathroom. Identify which parts you want to clean up and loosen up the dirt using a soft brush, after scrubbing softly, rinse with clean water. Go ahead and use your vinegar mixture to spray the area. After letting the solution to settle in for about half an hour, scrub it off using a soft brush making sure you clean each corner and gap in your bathroom. After this, rinse the bathroom properly with clean water. Note that vinegar shouldn’t be used in natural stones. It is therefore wise to check with your manufacture if you are not sure what your bathroom floor is made of. This is because permanent damage can be caused. 6. Chlorine bleach- If you want your grout and tiles to become white then bleach is your best solution. Before anything else make sure the room is perfectly aired. This is because the vapors produced are dangerous while inhaled. You need to mix three cups of water with one of bleach and one teaspoonful of shampoo. Mix the mixture well and put it into a spray bottle. Spray it evenly on the bathrooms floor and wait for it to settle for about half an hour. Then using a soft brush scrub gently but firmly and ensure that you reach every corner and hidden places. Consider using a toothbrush for places you can’t reach. You could also just use a wet rag to clean up the tiles. Rinse the entire place well with clean water is careful to avoid any remains of chlorine because it is usually very slippery. For better results just mix chlorine bleach with shampoo otherwise some cleaning products will form dangerous gases. Maintaining cleanliness in your bathroom is the easiest thing if done properly. All you need is the knowhow and you will be ready to go.